The role that Information Communication Technologies (ICT) plays in improving the efficiency and effectiveness of healthcare delivery has been well established. However, the effectiveness on current immunization systems, its political, social, economic and technology challenges have not been investigated fully. This paper investigates the potential role of ICTs in enhancing and improved understanding of immunization health care problems. 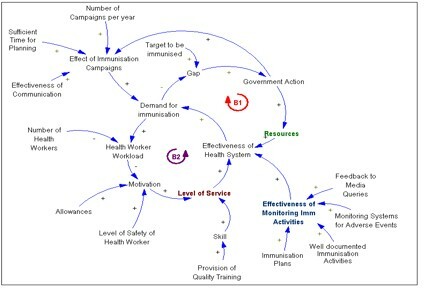 The paper presents a qualitative model, a causal loop diagram showing the key issues pertaining to the immunisation healthcare system effectiveness. The paper uses the model to present the status of the current immunisation system in Uganda and proposes a framework of how ICT can be used to enhance immunisation coverage. Keywords: ICT, Immunisation System; Healthcare; Immunization coverage; System Dynamics modelling. The role Information Communication Technologies (ICTs) play in improving the efficiencies and effectiveness of healthcare delivery has been well established. However, the same is not true for developing countries in general. Traditional and new ICTs are being used to diffuse information to rural communities in developing countries and for immunisation systems in particular (Gurstein, 2001). Developing countries still lag behind in advances in information technologies although they are increasingly being used in the availability of healthcare in remote areas, (Musa, Meso and Mbarika, 2005). Preventable childhood diseases such as measles, polio and premature deaths still occur particularly in the developing countries due to low immunization coverage (WHO, 1999). In a study to evaluate new tendencies and strategies in international immunization, Martin and Marshall (2002) suggest that “failure to immunize the world’s children with life saving vaccines results in more than 3 million premature deaths annually”.In Uganda, a nationwide survey showed that 46% of the children (12-23 months) had received all the recommended vaccines (UBOS, 2007). Mbarika (2004) suggests that, healthcare is one of the most fundamental needs for Sub-Saharan Africa. Various approaches have been applied to understand immunization coverage problems, however, there are still acknowledged deficiencies in these approaches and this has given rise to find alternative solutions including the use of new technologies to address some of these problems. Primary healthcare has the role of monitoring of outbreaks and providing optimum continuous care for many diseases and is characterized by uncertainty, complexity, time delays and competitive stakeholder viewpoints. ICTs offer a platform for health education which plays a major role in the prevention of many diseases. The World Health organization has targeted measles for eradication in several regions of the world by the year 2010, but despite an effective vaccine there is still estimated to be 30-40 million measles cases and 800,000 deaths per year [WHO, 1999; 2000]. Various approaches have been applied to understand immunization coverage problems, however, there are acknowledged deficiencies in these approaches. This is clearly demonstrated in Uganda, where despite many immunization campaigns through media, health visits and improved health services management, the coverage rate in Uganda is generally still low (less than 60%) [WHO, 2001]. 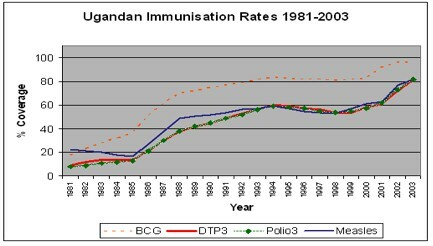 Figure 1, illustrates immunization coverage rates in Uganda over 22 years. BCG immunization rates are higher than those of Polio3, Measles and DTP3 due to the fact that it is administered at birth while the rest are administered after some scheduled time. Immunisation coverage is very dynamic and can only be sustained by continuous campaigns. As the immunization coverage rates decline, campaigns and different forms of advertising are used as a ”quick fix” to change the negative response towards immunization. This results in high dependence on campaigns, word of mouth and advertising whose effect wares off with time and the rates fall back to unacceptable levels. Developing countries such as Uganda are faced with the challenge of solving problems that lead to the delivery of poor health services, inefficient use of resources and failure to meet the people’s health needs. Governments, donor agencies and projects have made a lot of contributions towards an increase in immunization rates through improvements of health infrastructure, financing, supplies, staffing and management of national immunization programs. There is need to develop systems that fit the requirements of developing countries that are able to provide information that is critical for evaluation of services, policy design and analysis. The government of Uganda has designated ICT as a priority policy area and is harnessing the ICT sector for national development (Scan-ICT Project, 2002). ICT penetration is low in the Ugandan healthcare environments, although most of the major hospitals and the medical schools use computers for administrative purposes. ICTs have greatly impacted the health sector and are increasingly being used to improve the administrative efficiency of health systems. Service delivery in the health sector is still a challenge in many developing countries due to deficiencies in delivery, facility and equipment upkeep, inequity of access by rural communities, inefficient allocation of scarce resources and lack of coordination among key stakeholders (Fraser and McGrath, 2000). The use of ICT technologies may increase the quality of health service delivery by providing reliable information and efficient use of resources (Rwashana and Williams, 2007). The availability of information and communication techniques and tools enable rural communities to access health care services which otherwise would be difficult under conventional healthcare systems. Are there existing cases on the use of ICT in healthcare ? What kind of data and information may be collected to understand the extent of immunization system and immunisation coverage ? Who are real stakeholders in the immunisation system ? How should such an immunization system work? What kind of ICTs may be used to enhance delivery of healthcare services? How can ICT tools and techniques be adopted to improve the management of the Ugandan immunization system? 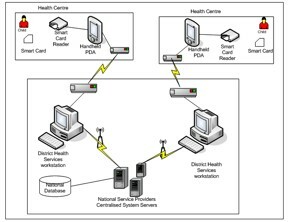 The use of ICTs is rather limited in healthcare particularly in developing countries where healthcare systems are mainly used for storage and transportation of textual information using stand-alone computers. Some of the healthcare systems that have been developed include billing, financial systems, patient registration, computer based record systems and pharmacy systems. Most of lab equipment and radiology equipment are now computerized and linked through data networks. Telemedicine which uses telecommunication and multimedia technologies is now increasingly used for remote consultation, diagnostics and examination of patients over the internet. As far as improving education in health is concerned, ICTs are being used for sharing documents, simulations of health scenario planning, training, interactive environments and self managed e-learning. HealthNet one of the most widely implemented computer-based telecommunications systems in sub-Saharan Africa, currently is being used in over 30 countries by around 10,000 healthcare workers to exchange ideas and provide medical solutions to various problems (Mbarika, 2004). HealthNet uses low earth orbit satellites and phonelines to provide email access system of local telecommunications sites used to provide low cost access to healthcare information in developing countries through a link to basic email (Kasozi and Nkuuhe, 2003). Users mainly physicians and medical workers connect to the network through local telephone nodes to access services such as physician collaborations (Mozambique, Tanzania, Uganda). Data collection (Gambia), healthcare delivery (Ethiopia), research (Ghana), medical databases, consultation and referral scheduling, epidemic alerts and medical libraries. Mozambique a sub-Saharan Africa country, launched its first TeleMedicine project in 1998. This was mainly a link connecting two central hospitals was built based on existing terrestrial and satellite communications system using low cost equipment for transmission, exchange and visualization of images and radiographs (ITU,1998). In Uganda hand-helds (EpiHandy) are being used by healthcare staff for communication (e-mail), demographic studies and surveys, consultations and treatment guidelines (Kasozi and Nkuuhe, 2003). Across Sub-Saharan Africa, the Internet is used to report daily cases of meningitis to monitor emerging epidemics. SatelLife uses low orbit communication satellites to link up doctors via the internet through “store and forward technology (Groves, 1996). SatelLife provides service to remote medical units through email and internet traffic as international telephone connections to capital cities in the developing world. When epidemic threshold levels are reached, mass vaccination is required and the Internet is used to rapidly mobilize medical personnel and effectively coordinate laboratories and specialist services. (SATELLife PDA Project, 2002). Nambaziira (2006) designed an online tool for ordering, distribution and monitoring of vaccines from the central stores to the various districts. Some of the functionalities included the capture and generation of reports for vaccine requisitions, supplies, issuances and disposals. A tool with such capabilities may be used in the monitoring of vaccines and that would reduce on the vaccine wastage eventually minimizing the costs. The above studies show that various technologies have been used to improve healthcare dlivery in remote areas although some of the problems pertaining to healthcare are not adequately addressed. There is need to define and capture different viewpoints of stakeholders. It is evidently that the issues that pose most challenges are systemic in nature and conceptualising such systems should use system thinking tools. In a study carried out to assess health information access and dissemination in Uganda, Omona and Ikoja (2006) suggest that there is need to support and promote ICT as the most effective tool for health information access and dissemination. Levels of motivation of health workers which is associated with level of facilitation, remuneration, workload, provision of quality training which includes number of trainers, frequency of refresher courses, level of clinical practice and use of materials relevant to local culture. Efficiency of health facilities which is affected by the availability of financial resources, availability of equipment, promotional activities and number of skilled health workers and proper management. Effectiveness of monitoring of immunisation activities which involves the following monitoring systems for adverse events, documentation of immunisation activities, display of immunisation activities, reporting of immunisation activities and reviews of immunisation plans. Effectiveness of immunisation campaigns which is affected by the frequency of change in schedule (how often the vaccine schedules are changed), number of campaigns in a year, availability of allowances, sufficient time for planning and effectiveness of communication. 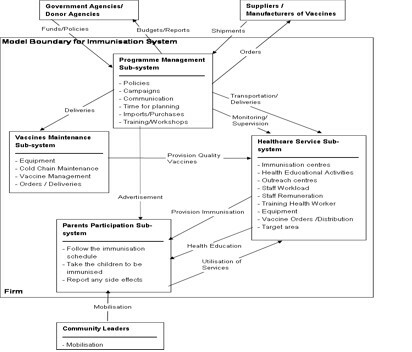 Figure 2, illustrates the intricate and complex relationships among factors affecting immunization coverage from a healthcare system perspective and a number of feedback loops which may help to explain different immunization coverage levels. The relationships between the variables are presented with a connector which illustrates a cause and effect relationship with (+) denoting positive influence and (-) denoting a negative influence. The overall effect of the relationships in a closed system results into a feedback loop which is a control system which has input and output to the system where the output of the system is fed back into the system as part of its input. The key variables that play a key role in the provision of healthcare services are resources (health centres, facilities) and level of service which results from the motivation of health workers. Two balancing loops B1 and B2 where a balancing loop is a negative feedback system that is self regulating and seeks stability or aims for a specified target. Loop B1 seeks to achieve the set immunization targets by focusing on the health service delivery. The difference between the targeted number of children and the actual number of children immunized creates a gap which triggers an increase in government funding for immunisation programmes. An increase in funding results in increased resources and health centres which when coupled high level of service will increase effectiveness of the healthcare system which in turn improves the demand for immunisation. Loop B2 is a balancing loop, which represents the limiting factor resulting from increased demand as far as the effectiveness of the healthcare system is concerned. An increase in demand results in increased workload which reduces health worker motivation resulting in reduced level of service which affects the provision of healthcare services. An effective health system requires management of resources, effective monitoring and reporting as well as well-motivated health workers. Health service delivery - Proper management of financial and logistical support, stock management and effective monitoring of immunization activities should be addressed for improved health service delivery and minimizing missed opportunities due to stock outs. Health worker motivation. The provision of immunization services requires highly motivated health workers who are well trained, remunerated, facilitated and with acceptable workload. Effective monitoring of immunization activities by carrying out regular supervisions of health units that provide immunization services. Mobilization and health education - There is need to have continuous mobilization and health education to educate the communities on the importance of immunization, immunisable diseases, vaccines, side effects etc. Effective mobilization and education can be attained through well-planned campaigns, multiple channels of communication, community participation, media and through the delivery of content that is relevant to the community. From the causal loop diagram, a broad integrated view of the system is provided for the stakeholder to prioritize and set policies. The different ICT requirements and information systems that need to be developed for the improvement of immunization coverage can then be generated from a clear understanding of the system. Healthcare services in developing countries such as Uganda, in particular immunization services are provided through a decentralized system consisting of geographically spread health centres, regional hospitals which are categorized into health districts and health sub-districts with various roles (Barenzi, et al., 2000). The development of health plans, policies and service delivery are channelled from the national level through the district, health sub-district, health centre right up to the community as illustrated in Figure 3. The decentralized health care system makes the management and process of planning easier, however, this requires an effective feedback system, supervision, monitoring and reporting if the goals of the system are to be achieved. Each health centre has its own immunization schedule and plans but it is desirable that the different health centres /hospitals offering immunization services work in a cooperative environment and be able to exchange data and information on service delivery. In order to improve the efficiency and effectiveness of immunization health services provided in such a distributed structure, it is vital that information is shared since it is a vital resource to the management of any organisation. Effective data collection and sharing of information can be enhanced through the application of information and communication technologies. Health care services like any other business involve a lot of transactions such as importation and delivery of medicines; construction of hospitals and clinics; hiring and deploying staff; processing and payments of staff salaries. Other activities include the purchase and delivery of food for patients; collecting and analysing disease spread data in a country, and educating the community about good healthy living (Wasukira, Somerwel and Wendt, 2003). ICTs provide a competitive leverage to respond to the challenges of maintaining up-to-date immunization records (fully immunized and drop outs), tracking of facilities and vaccines, stock management, vehicle tracking and human resource management required by the immunization system. In order to understand the health system as well as the factors that influence immunization coverage, survey research supported by semi-structured interviews were conducted. The study area Mukono District, lies in the Central region of Uganda comprises of four counties (island(1) and mainland(3)) and has a good representation of both rural (83%) and urban population (17%) with a population density of 264 persons per sq. Km. Plan on immunisation activities which involves planning of immunisation activities, definition of target population and service area. Immunisation sessions which involve preparation of equipment, vaccines, safe injection practices, transport, management of human resource (health workers) and vaccine wastage. Out of the health facilities that were visited only two (2) private hospitals used computers for the registration of patients. None of the health facilities used computers to process immunisation activities. Seven (7) out of the eight (8) health facilities had a well documented plan on immunisation activities, although five (5) of them did not state the contents of the plan as expected by the national standards. Only four (4) of the health facilities were able to define both their target population and service area which made determination of vaccine requirements difficult. All except one health facility admitted as carrying out reviews of immunisation activities. All health facilities stated that they carried out monthly reports, although most of them did not include the required details such as number of children immunized, obstacles to immunisation, EPI plan for next month, usage of vaccines, vaccine wastage and performance achievements as stated in the UNEPI handbook. Some of the documents such as HMIS forms, Immunisation Tally sheets, child health registers were not used by some of the health facilities. The system diagram which is a high-level map showing the overall architecture of the model and conveys information on the boundary and levels of aggregation in the model was developed. The immunisation system diagram shows the number and types of different organisations or agents, key processes, activities, stakeholders and flow of information. The system diagram does not show the influences and causality which provide a deeper understanding of the immunisation system. Community sub-system: represents the population that utilises the immunisation services. Healthcare service sub-system: responsible for the provision of immunisation services to the population. Immunisation management sub-system: responsible for the management, monitoring and supervision of immunisation services at the national level. Vaccines maintenance sub-system: responsible for the management and delivery of quality vaccines. The key external agents include the government and donor agencies that provide the funds necessary to run the immunisation programs, vaccine manufacturing organisations and the local leaders who carry out mobilisations in the communities. Two (2) of the health centers stated that they had not had expired vaccines since they normally ordered what was enough, while six (6) occasionally discarded expired vaccines. Six of the health centers had not experienced stock outs while the two of them had. Stock outs were attributed to unavailability of transport and unexpected high turn up of children. All the health facilities confirmed that they still required improvements in some areas and required more facilities. Some of the activities that needed strengthening included : mobilization of mothers, record keeping, routine supervision from the district officials, timely delivery of vaccines to avoid stock outs, training of community workers. The majority of health facilities (5) stated that they needed to increase the number of health workers as well as training. All the health facilities lack sufficient resources such as: vaccine equipment, vaccine storage facilities, transport facilities, utilities, mobilization tools, laboratory supplies, staff housing, remuneration and allowances, recording facilities. According to SCAN-ICT Project (2002), most governments health units have generally low ICT usage due to lack of basic ICT infrastructure. 80% of the Ugandan population is rural based with no electricity distribution thus constraining the diffusion of all forms of ICT. Internet connectivity and email usage in the health sector is still low compared to other sectors. Medical personnel most commonly use computers like accountants and secretaries. Until 1993, Uganda had a centralized health information system (HIS) which focussed on morbidity and mortality reporting, with data flowing only from individual health units to the district and national level. A health management information system (HMIS) that emphasizes use of information at the point of collection is currently in use (Gladwin, Dixon and Wilson, 2003). In a resource constrained economy like Uganda, the responsibilities for planning, resource mobilization and allocation, management immunization services, storage and distribution of vaccines, supplies and equipment to the units under their supervision, maintenance of cold chain and training are done at the district and sub-district level. The district is responsible for support supervision, surveillance, management of outbreaks, development of training materials, social mobilization and advocacy. The health sub-districts are responsible for collecting, using and disseminating data, carrying out routine maintenance of cold chain, reporting and management of outbreaks. Immunization records, at the health unit level are done on paper registers and tally sheets by the health workers. The tally sheets are forwarded to the health district level for entry into a computerized database Health Management Information System (HMIS). Districts that have a computer and resources to maintain it, are provided with an easy spreadsheet based system for compiling monthly and annual reports. The reports from the districts are delivered to the headquarters either by hand, fax or by email. The national office has a LAN at the headquarters to enable health offices gain access to the HMIS products such as the ministry of health website. Future expansion includes development of a WAN, to provide connectivity to the rest of the districts. The ICT infrastructure enables the sharing the ICT capabilities which provide services for other systems of the organization (Broadbenta et al., 1999). For Broadbenta et al., (1999), these capabilities require the complex combination of the technical infrastructure (cabling infrastructure, hardware platform, base software platform), ICT shared services (as communications services), ICT applications (as WEB services), the human operators and the managerial expertise to guarantee reliable services. Health Units: The health units will have a SMART card writer which can update the immunization records. Stock and logistics updates and orders will be captured by using the handheld devices / Personal Digital Assistant (PDA). The data is then uploaded onto the handheld device and sent to the district database through a fixed wireless terminal. Orders and updates of vaccines from the various health units is compiled to facilitate decision making processes at the district level. Reports on the performance of the various health units are generated and the data is then uploaded to the national database. Health workers will use the PDA to access immunization information (diseases, vaccines, side effects, immunization schedule, stock management) from the immunization content management system. Such information on a PDA when connected to the right video/audio output drivers could be shown using a TV monitor thus facilitating training and health education in the community. District level: At the district level, data can be used to prepare forecasts, analysis and plans for the district. The reports generated can be used for monitoring and tracking of vaccines, children, health workers as well as preparing requisitions and facilitate distributions of vaccines to the various health sub districts and health units. The data from all the districts is compiled to obtain the national immunization performance. The data can then be used to generate national targets, imports of vaccines and supplies, management of staff and equipment as well as enhance decision making process for long term plans. National level: An immunisation content management system that has all the information pertaining to immunisation (diseases, vaccines, schedules, side effects) and can be accessed by all districts and health units should be developed. A Health Management Information System linking all the health facilities at all community, district levels should be used for support and monitoring of immunization activities, planning. decision making, education and disease surveillance. Improved sharing and dissemination of reliable information concerning vaccine administration, storage, side effects through online accessibility to the medical workers as well as the public improving their attitude towards immunization. Timely reporting of disease outbreaks/ epidemics will be made easier thus enabling timely interventions by the authorities. Reduction in time delays for mothers due to reduced manual recording processes. Improved coordination and monitoring of immunization activities, facilities and equipment upkeep and allocation of scarce resources. Improved overall administrative effectiveness of the immunization system which results in efficient use of resources both human and financial. Simple, low cost techniques that are sustainable should be developed based on the following strategies for overcoming barriers to the successful integration of ICT into the delivery of immunization healthcare systems. First, the development use of standardised systems. Second, the government needs to provide political leadership to accelerate the adoption of electronic health systems and, third to create a public database that holds data at the community level, but is fed through the decision making structure to improve healthcare provision nationally and local level. There is need to adopt new technologies such as grid computing in which the limited computing resources at several locations can be combined to undertake massive computing tasks as provide flexible use of resources for a variety of applications. Barenzi, J. Makumbi, I.and Seruyange, I. (2000). Immunization practice in Uganda. A manual for operational level health workers. UNEPI/TRA. Borooah, V.K., (2003). Gender bias among children in India in their diet and immunization against disease. Social Science and Medicine Journal, vol. 58, pp1719-1731. Broadbent,M.,Weill,P.andSt.Clair,D. (1999),‘‘The implications of information technology infrastructure for business process redesign, MIS Quarterly, vol.23, no. 2, pp159-82. Chanopas, A., Krairit, D. and Khang, D.B. (2006). Managing information technology infrastructure : a new flexibility framework. Management Research News vol. 29, no.10, pp. 632-651. DISH II Project (2002). Childhood Immunization in Uganda : A Report of Qualitative Research, K2-Research Uganda Ltd. Drain P.K., Ralaivao J.S., Rakotonandrasana A., Carnell M.A.,(2003).Introducing auto-disable syringes to the national immunization programme in Madagascar. Bulletin of WHO, vol.81, no. 8. Fraser, H.S.F. and McGrath, J.D. (2000). Information technology and telemedicine in sub-Saharan Africa. British Medical Journal vol. 321, pp. 465-466. Gladwin, J., Dixon, R.A. and Wilson, T.D. (2003). Implementing a new health management information system. Health Policy and Planning. vol. 18, no.2. Groves, T. (1996) SatelLife : getting relevant information to the developing world. British Medical Journal vol. 313, pp1606-1609. Martin, J.F. and Marshall, J. (2002). New tendencies and strategies in international immunization: GAVI and The Vaccine Fund. Vaccine vol. 21, pp. 587-592. Mbarika, V.W.A. (2004). Is Telemedicine the Panacea for Sub-Saharan Africa’s Medical Nightmare? Communication for the ACM, vol. 47, no.7, pp. 21-24. Musa,P.F., Meso,P., and Mbarika,V.W. (2005). Toward sustainable adoption of technologies for human development in Sub-Saharan Africa : Precursors, diagnostics and prescriptions. Communications of Associations for Information Systems. Vol.15, pp.33. Nambaziira, S. (2006). An online tool for Monitoring and tracking vaccines and vaccine logistics utilization at district level in Uganda. Masters Thesis. Omona and Ikoja-Odongo (2006). Application of information and communication technology (ICT) in health... Journal of Librarianship and Information Science; vol. 38, pp.45-55. Rwashana A.S. and Williams D.W. (2007). 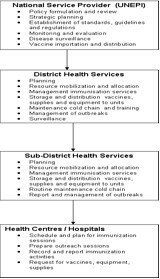 Enhancing Immunization Coverage through Health Information Systems : A System Dynamics Approach. Stud Health Technol Inform. vol. 130, pp. 247-56. SATELLIFE PDA Project (2002).Testing the use of handheld computers for heathcare in Ghana, Uganda, and Kenya. Report published: 28 February 2003. Scan-ICT Project Report (2002).Status of ICT in Uganda. Uganda Country Report. UBOS (2007). 2006 Uganda Demographic and Health Survey. Uganda Bureau of Statistics and Macro International Inc. Aug 2007. Wasukira, E., Somerwel, F. and Wendt, D. (2003). ICT for development : ICT in Health Seminar. I-network Uganda. Vol. 2, pp.4 . World Health Organization (1999). Measles. Progress towards global control and regional elimination. Weekly Epidemiology, vol. 74, no. 50, pp. 429-434. World Health Organizationc(2001).c Country Office for Uganda, Immunization Drop-Out in Uganda. IDS/Health Information Bulletin. 2001.